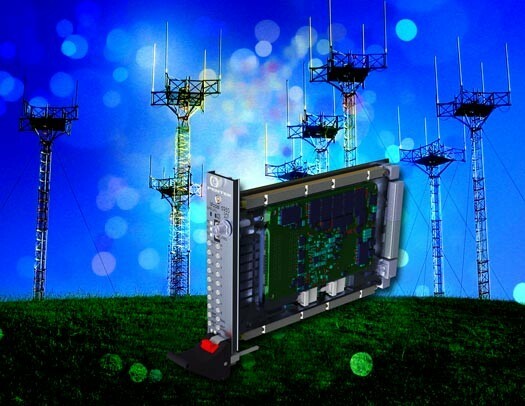 UPPER SADDLE RIVER, NJ─Pentek, Inc., today introduced its first product in the Quartz™ Architecture family, the Model 5950, an eight-channel A/D and D/A converter, 3U OpenVPX board based on the Xilinx Zynq UltraScale+ RFSoC FPGA. The low latency benefits of the Quartz architecture support DRFM (Digital RF Memory) and radar applications that were previously not possible with earlier generation products. The Model 5950 is pre-loaded with a suite of Pentek IP modules to provide data capture and processing solutions for many common applications. Modules include DMA engines, DDR4 memory controller, test signal and metadata generators, data packing and flow control. The board comes pre-installed with IP for DFRM, triggered waveform and radar chirp generator, triggered radar range gate engine, wideband real-time transient capture, flexible multi-mode data acquisition and extended decimation. The Model 5950 can be used out-of-the-box with the built-in functions requiring no FPGA development. The front end accepts analog IF or RF inputs on eight front panel MMCX connectors with transformer-coupling to eight 4 GSPS 12-bit A/D converters delivering either real or complex DDC samples. With additional IP-based decimation filters, the overall DDC decimation is programmable from 2 to 128. The eight D/A converters accept baseband real or complex data streams from the FPGA’s programmable logic. Each 6.4 GSPS 14-bit D/A includes a digital upconverter with independent tuning and interpolations of 1x, 2x, 4x and 8x. Each D/A output is transformer-coupled to a front panel MMCX connector. The Model 5950 supports VITA-66.4 providing eight 28 Gb/sec duplex optical lanes to the backplane. With two built-in 100 GigE UDP interfaces or a user-installed serial protocol, the VITA-66.4 interface enables gigabit communications independent of the PCIe interface. The Navigator FDK includes the board’s entire FPGA design as a block diagram that can be edited in Xilinx's Vivado tool suite, all source code and complete documentation is included. Developers can integrate their IP along with the factory-installed functions or use the Navigator kit to replace the IP with their own. The Navigator FDK Library is AXI-4 compliant, providing a well defined interface for developing custom IP or integrating IP from other sources. The Navigator BSP supports Xilinx’s PetaLinux on the ARM processors. Users work efficiently using high-level API functions, or gain full access to the underlying libraries including source code. Pentek provides numerous examples to assist in the development of new applications. The 3U VPX SPARK development systems are ready for immediate operation with software and hardware installed. In many applications, the SPARK development system can become the final deployed application platform. Pentek, Quartz, QuartzXM Navigator and SPARK are trademarks or registered trademarks of Pentek, Inc. Brand or product names are registered trademarks or trademarks of their respective holders.